For TV broadcasters and content producers who want to reach older children and tweens with interactive livestreaming, Zender is cloud-based software that makes publishing and managing digital live formats easy. Get 1:1 time with a Zender expert, and learn how the tool helps you achieve your digital viewership goals. How to reach a 'digital first, mobile first' young audience? Upgrade your traditional one-way communication. Give the kids a voice, and see the interaction fly over the screen. Grow your community as more and more children tune in for your live broadcasts every time. The presenter asks the question, all children can provide their answer and see the results live on screen. In realtime. What's not to like? Imagine. Your favourite TV personality is locked in a room. It's up to you and the other kids watching to give clues to make it out of there in time. Game ON! Always wanted to ask your football hero what he has for breakfast? Or how that vlogger makes her smashing intros? A live Q&A session is your chance! Zapplive, a weekly children's TV-show in the Netherlands, integrated Zender with their studio and website in 1 week and saw the viewer's engagement flying over the screen. The chat is kept kid-safe by the editorial team. Sudden bursts of peak traffic are handled in the background by Zender, so Zapplive can guarantee a broadcaster-grade experience for their viewers. When Ketnet, a national children's TV channel in Belgium, has a live event they like to treat their digital audience to an exclusive look behind the scenes. Using Zender, Ketnet sets this up in no time. The viewers get to ask questions or even have an impact on the show. Custom emojis are created, like the 4 dots on the back of your hand that symbolise you're against bullying. 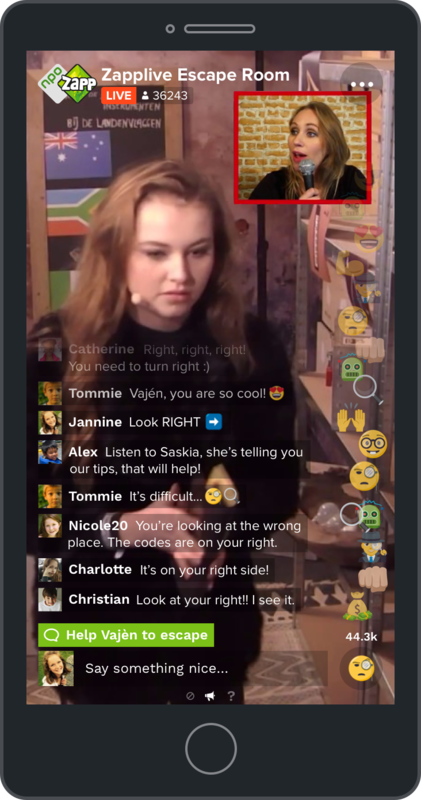 During this behind the scenes interactive live moment, kids sent thousands of emoji showing their support.